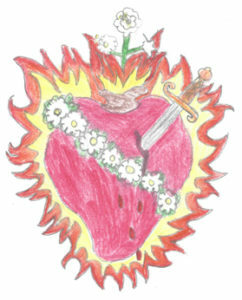 We ask that each Children’s Rosary group be Consecrated to the Sacred Heart of Jesus and Immaculate Heart of Mary at the first meeting. In this way the group is under the protection and guidance of Christ and His Mother. We have Consecration prayers provided below but if you would like to use different prayers that would be fine as well. 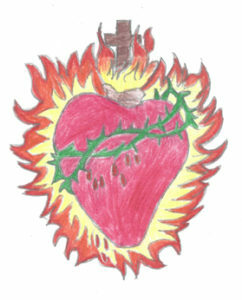 We only ask that they are Consecration prayers to the Sacred Heart of Jesus and Immaculate Heart of Mary. The Consecration prayers can be read at the beginning of the first meeting by the group leader or priest if one is present. All those participating are invited to say amen if they agree. with us so that we will not be lost. Cause hatred to disappear among men. and free us from all sin. Jesus, enter into each heart. You suffered for us. Amen. Hand drawings were done by Alina Kaufman in 2016. Alina is a child who has been a member of the Children's Rosary for five years.